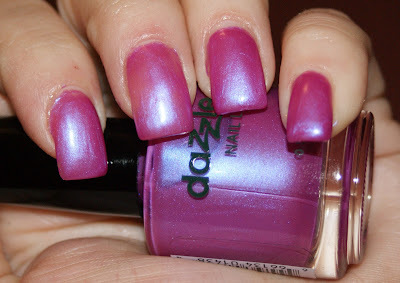 Today, I'm bringing to you a shade from the just-released Summer Scape collection by Dazzle Dry called Calypso Romance. In the bottle, Calypso Romance has a prominent blue shimmer. But did it translate to the nail? You bet that it did! 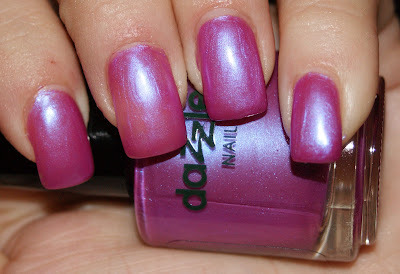 It's a nice grape-toned nail polish with a blue flash, but I wouldn't go so far as to say that it's a duochrome. Rather, I would just call it a frost. Seen from a different angle, the shade looks exactly the same. But it's still gorgeous and applies like a dream. I thought it was a little watery at first, but it built up great on the second coat, so the formula is just a little thin. Though it honestly does not make a difference on the nail. Per usual, I used the 3 Piece Nail System because as you know from last time, I am in LOVE with their top coat! 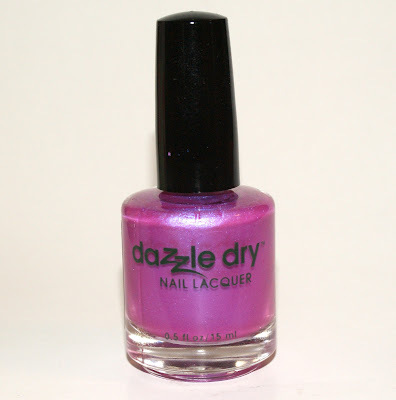 Dazzle Dry Nail Lacquers retail for $9.00 and each bottle contains .5 fl oz. of polish. The Dazzle Dry 3 Piece Nail System retails for $28.50. All polish is vegan-friendly and 3-free! Plus, it strengthens your natural nails and is non-yellowing! Wow look at the blue in this! Gorgeous! Love the color. I really need to dry Dazzle Dry.